first quarter of 6th century B.C. Inscription: Inscribed in the Corinthian alphabet with the names of the figures represented: Athena, Herakles and Iolaos. Iolaos is named a second time with his patronymic, Wiphikledas. These inscriptions were translated by Ken Hamma. 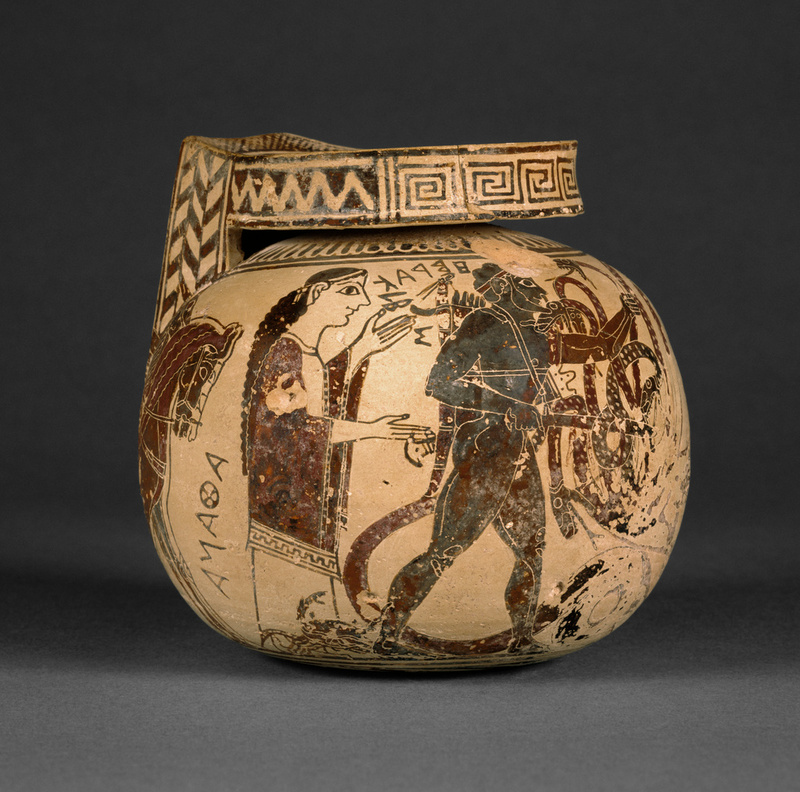 On this intricately detailed Corinthian black-figure aryballos (oil-flask), Herakles battles the Lernean Hydra, a many-headed, serpent-like monster. Required to destroy the fierce creature as the second of the Twelve Labors assigned to him by King Eurystheus, the hero grasps one of the snaky heads while stabbing the monster with his sword. One of the Hydra’s heads is about to bite Herakles’ shoulder, and a crab, sent to help the Hydra, approaches the hero’s ankle from behind. The goddess Athena stands behind him, offering her support. Both Herakles and Athena are identified by inscriptions written in retrograde, or right to left, in the distinctive Doric alphabet of Corinth. Likewise, inscriptions on the other side of the vase identify Iolaos, Herakles’ nephew and faithful companion, and Iphikles (written as Wiphikledas), Herakles’ twin brother. One figure holds the Hydra, while the other (under the handle of the vase) is shown as a charioteer, head turned back to face the action while keeping the four-horse chariot ready to carry off the victorious hero. An unidentified female head facing left decorates the handle itself. Corinthian vase-painters used the black-figure technique—in which figures are painted in black silhouette, with details incised and added in white and red paint—to produce some of the earliest narrative scenes in Archaic Greek art. They excelled, in particular, in mastering the miniature picture frieze, where complex mythological stories were artfully rendered in great detail on the surfaces of small vessels. Although aryballoi, small containers for scented oils, were mass-produced and widely distributed, few are as elaborately decorated or as well made as this example. Galerie Nefer (Zurich, Switzerland), sold to Barbara and Lawrence Fleischman, 1989. "Acquisitions/1992." The J. Paul Getty Museum Journal 21 (1993), p. 106, no. 7. The J. Paul Getty Museum Handbook of the Collections. 4th ed. (Los Angeles: J. Paul Getty Museum, 1997), p. 44. Towne Markus, Elana. Masterpieces of the J. Paul Getty Museum: Antiquities. (Los Angeles: J. Paul Getty Museum, 1997), p. 33. The J. Paul Getty Museum Handbook of the Collections. 6th ed. (Los Angeles: J. Paul Getty Museum, 2001), p. 44. The J. Paul Getty Museum Handbook of the Antiquities Collection (Los Angeles: 2002), p. 55. Cohen, Beth, ed. The Colors of Clay: Special Techniques in Athenian Vases, exh. cat. (Los Angeles: The J. Paul Getty Museum, 2006), p. 152, fig. 2. Arvanitaki, Anna. Hero and the Polis: The Example of Herakles in the Archaic Iconography of Corinth (Thessaloniki: University Studio Press, 2006), p. 75, fig. 43a-d. The J. Paul Getty Museum Handbook of the Collections. 7th ed. (Los Angeles: J. Paul Getty Museum, 2007), p. 25, ill.
Hall, Jonathan M. A History of the Archaic Greek World, ca. 1200-479 BCE. Malden, MA: Blackwell Pub, 2007, p. 115, fig. 5.3. The J. Paul Getty Museum Handbook of the Antiquities Collection. Rev. ed. (Los Angeles: J. Paul Getty Museum, 2010), p. 57. Padgett, Michael J. "The Serpent in the Garden: Herakles, Ladon, and the Hydra." In Approaching the Ancient Artifact. A. Avramidou and D. Demetriou, eds. (Berlin: de Gruyter, 2014), 44, footnote 2. Pieraccini, Lisa C. "Sacred Serpent Symbols: The Bearded Snakes of Etruria." Journal of Ancient Egyptian Interconnections 10 (2016), p. 93, fig. 2.